I threw it in my purse and took it everywhere. After two-and-a-half weeks of playing with my new toy -- one that promises to revolutionize photography -- I remain tantalized by the potential of the science behind it, but less enamored with the product itself. I've put the camera through its paces in a variety of circumstances, bright light, low light, indoors and out. One note on composition: To fully appreciate the unique capability of this camera versus traditional photo technology, you have to have enough of an artist's eye to appropriately frame a shot -- its a whole new degree of composition, because if your field doesn't include near and far objects, you don't really experience the magic. - The obvious...the "living picture" concept is waaaaay cool. - Beautiful design. The unit is minimalist and attractive. If you didn't know it was a Lytro, you might mistake it for an Apple product. - Size. Small enough to throw in a purse or jacket pocket, if a bit too large for the average guy to throw in his pants pocket (is that a Lytro in there or are you just happy to see me? ), it's easily portable. - Very cool exposure range. They don't advertise this, and this is a total WAG, but I'm thinking the same science that allows them to capture focus data from the entire light spectrum also allows the camera to achieve impressive exposure results. The camera boasts no flash -- every shot is dependent upon available light -- yet the quality of the exposure is really impressive. 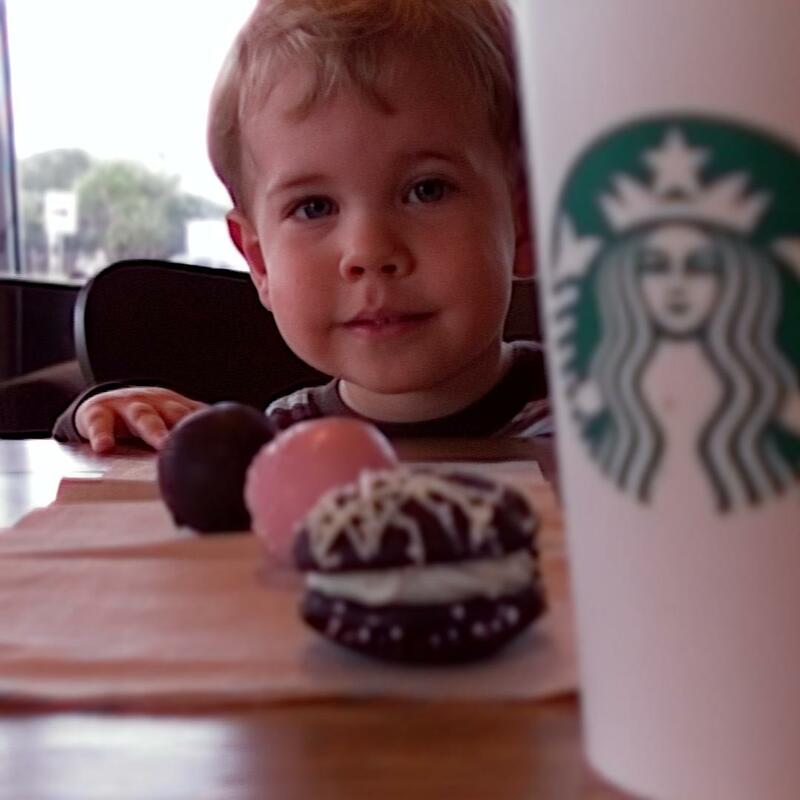 I took a picture of Bitty Boy a few days ago in a dimly lit Starbucks backlit by the window. Not only can you see BB's face beautifully, but the windows aren't blown out behind him...you can still see the trees outside. The photographer can control the exposure a bit, though it's not intuitive and took me until today to discover. You can set the priority exposure point by touching the viewfinder and allowing it to adjust before snapping the photo. - The instructions. That's right, for your hard-earned dollars, you get about 1/2 of an 8.5 x 11" page accordion-folded with 13 brief points on it. They may have been going for plug-and-play simplicity, but not every feature is listed or intuitive. (See exposure above.) To remedy this, they have a good enough support site, however, major features that can really trip up your photos -- like the difference between everyday and creative mode -- are completely absent from the basic instructions. Beware, it IS possible to take a completely blurry photo with this camera if you don't understand what mode you're in. - The lens cap. So, the lens cap is a small magnetic square. Very sleek, less functional. Every time I pull the camera out of my purse, I have to fish out the lens cap separately. The inevitable moment when the (irreplaceable!) lens comes into contact with keys or coins is sure to incite an epic crying jag. - The touch screen, the frustrating, useless touch screen! This one is so gigantically irritating, it has it's own sub-points. First, it's a terrible viewfinder (in old-fashioned shooter parlance). 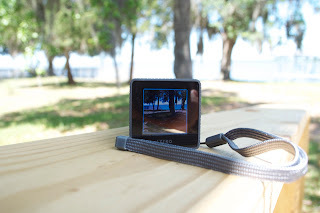 On a modern point-and-shoot, this is the equivalent to the in-unit LCD that allows you to see what you're shooting. 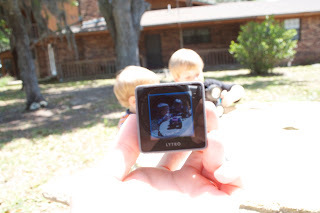 On the Lytro, trying to see what you're shooting in daylight is like trying to read your iPad in direct sun. I'm guessing there was some kind of discussion about capacitative touch being the modern standard, and so they were forced to choose between what's cutting-edge cool for the consumer and what would make the best camera from a photographer's perspective. Clearly, Lytro's designers chose form over function. to show the viewfinder...see how the table's blown out? Second, remember the days of the television you had to view straight-on to see? Similarly, if you're not squarely, PERFECTLY behind the viewfinder, hang it up. With two strikes against it for difficulty to view in almost every lighting scenario and from almost any angle, I can't believe they went into production with this limitation. - Soft exposures. The design of the camera, while attractive, makes it extremely difficult to hold steady. So the very capability that it claims as its greatest feature -- the idea that you need not focus before snapping -- is completely negated by the degree of motion blur you get in anything other than ideal lighting. Understand, the camera can refocus after shooting based on taking in data from the entire field from shallow to deep -- it cannot compensate for blur caused by unsteady hands. - Resolution. This is a real sticking point. We're all tired of talking in megapixels and the best photographers understand that you don't need anything more capable than an 8 MP camera to produce stunning professional results. 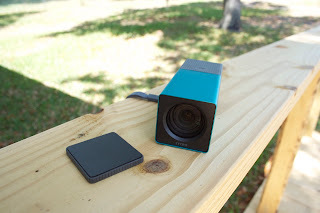 However, the Lytro doesn't do the same thing as other cameras, and so resolution seems to be a non-discussion. I've found that many of my images look pretty grainy, and I'm wondering whether the resolution would be high enough even if the technology allowed me to settle on a focal point and print my images (more about that below). I'm not convinced. - And finally, the real show-stopper. (This item has been updated. See below.) 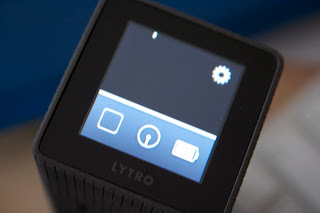 Lytro offers no way to export the photos except to share them on the company's proprietary website or through their facebook app. This limitation poses a significant inconvenience to consumers, and a complete stopping point for any thought of using this platform for the advancement of professional photography. I couldn't wait to put on my website: "Now offering Lytro living pictures," but what good does it do me -- either as a portrait or landscape photographer -- to produce a photo for a client that I can't provide to them in any other way than by posting it to my Lytro page? 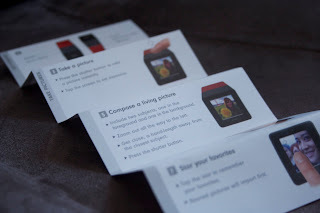 Let me absolutely clear on this point: YOU CANNOT in any way process, convert, email or print your photos. For me this is the real will-it-make-it-or-won't-it issue. 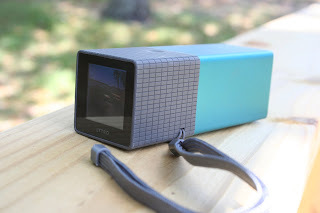 I've got to believe Lytro will remedy this quick, or the novelty will soon wear off as it becomes a glorified gadget. So if you're looking for a recommendation, mine is this. Hold off and watch what the company does. Surely they'll work out the sharing options soon, and with any luck, second generation will have a better viewfinder and greater stability. It's cool, but at $400 for the lower-end model, it makes an awfully pricey doorstop. UPDATE: So a friend pointed out my error and directed me to the support page that explains how to export to JPEG. I'm actually really happy to be wrong -- I had such a hard time believing they would market a product without this feature. That said, the exported product was unimpressive. The application exported a 1080 x 1080 JPEG, 74KB file. The option to export appears nowhere in the application menus, nor is it addressed in the instruction page. You must know to right-click (or control-click) on the image for the option, which means searching the support site. I continue to be frustrated by a product for which even basic functions must be the subject of a web search. Page 16 of the Users Guide (only 23 pages in all) tells how to export to JPG.